It all started months before when my friend Ironman Kenny Short asked me if I wanted to try a hill race to spice up my training , sure I said, sounds good to me !! …. 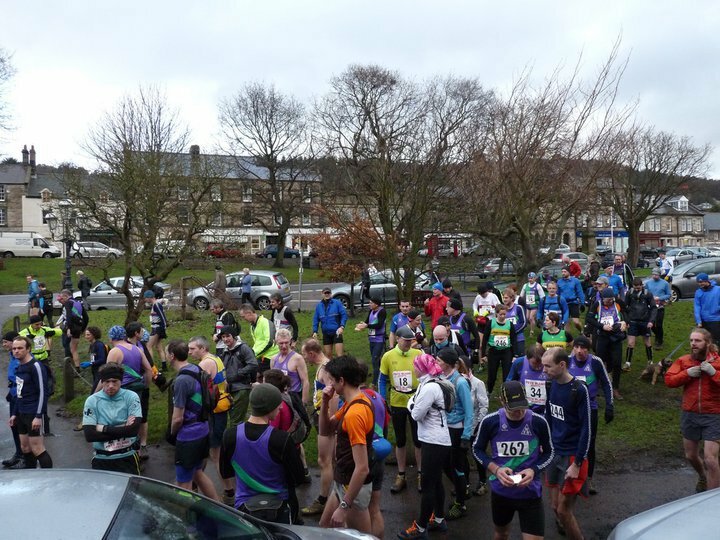 Unfortunately the weather came in hard , Snow and Ice postponed the race and it never happened but these hill runners are a hardy breed and as soon as the route became runnable it was back on . Now however my Ultrathon fitness program is in full swing and on top of this Im training with Louise and Ross for the Barcelona marathon , Im also busy doing twice a day runs to build up my recovery time for the MDS , so after a week of twice a day 8+5s , a 13 mile friday and a 17 mile Saturday run over Earlside moor road in gale force winds courtesy of Louise’ fetish for suffering I arrive in Rothbury car park on a cold Sunday morning with Kenny and my ever eager companion Darren “hillmeister” Murphy , K.J. a top runner from Hawick is also here to race. The beauty of this hill running is that you turn up in the morning , pay your fiver and your racing 20 minutes later … magic .. lets do it.. Looking around I realized that we were registering for a hill race amongst the best hill racers in the North , runners from Yorkshire , the lakes and even Fort William were here to race , and myself !!! , hmmm … this might be embarrassing I thought ?? So 100 of us lined up in the car park and bang!! a little gun goes off !!! and all of a sudden were off !! Everyone running down a little vennel , single file and out over a bridge , less than 50 meters and we hit a super steep hill , the hill climbs steeply for what seems like forever then we leave the road for some farm tracks , up and over another hill , a real one this time , super steep and climbing , climbing and more climbing , my legs are on fire by now .. the top boys are away , leaping and bounding up the hill , I watch them go as I slip into my steady ultra pace , nearly 70 miles into my legs already this week , I hope I can make it to the finish without too much trouble but I needn’t worry as my ultra training is really paying off now and I seem to recover like superman basking in the yellow sun . No more climbing , Im on the top of the fell now , I run across some heather laden moors , every footstep is 3″ deep in cold mud , running along sheep trails , over stiles and through forest tracks following white and red tape where the trail becomes non existent , this is amazing and I’m having the time of my life , my legs don’t hurt any more , I’m having too much fun for that .. I’m over halfway and the path starts to drop , the pace quickens and I’m running past crags that I visited years ago , I climbed routes on them back then , now I’m climbing up the side racing, frantically I’m trying to get to the next path so I can keep my pace up for the finish line .. next the path starts dropping steeply , I’m nearing the finish , now I can freewheel down through the hills and country lanes , closer to the finish , I turn the corner and the end is in sight , Kenny and Murph waiting to give me a cheer , what a day !! , I cant wait for the next one. Murph and I certainly had a ball on this one , so much so that I reckon were going to do a lot more of them and after all my ultras are finished I can certainly see me enjoying more Hill running . 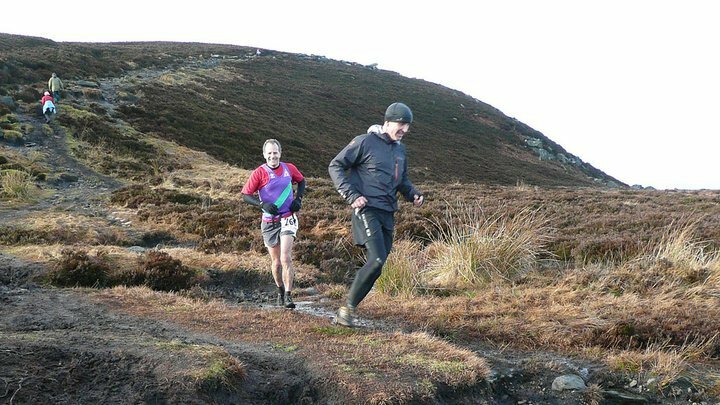 Races like Simonside are so important in keeping it all alive .. when you love what you do it requires no motivation , I must keep pushing because there can only be 1 result in the Desert and for that I must cross the finish line …. This entry was posted in Training and tagged 786, Hawick, Hill, hill running, Ironman, Marathon Des Sables, preperation, Running, Simonside, Training, Ultra Running, www.runner786.com. Bookmark the permalink.